Israel's UN ambassador responds to European nations' condemnation. "Settlements are not and never have been the main obstacle to peace." Israel's building in its own capital is not an obstable to peace, but rather the Arabs' demands and incitement, Israel's ambassador to the United Nations said on Wednesday. Ambassador Ron Prosor was responding to the condemnation by four European members of the Security Council of Israel's plans to build thousands of new housing units in Judea, Samaria and Jerusalem. "The planned construction is in neighborhoods that will be part of Jerusalem and Israeli sovereignty under any future agreement between Israel and the Palestinian Authority," he said. "It is hypocrisy to call for Palestinian territorial contiguity between Judea and Samaria and Gaza and in the same breath also oppose Jewish territorial contiguity between Ma'aleh Adumim and Jerusalem." 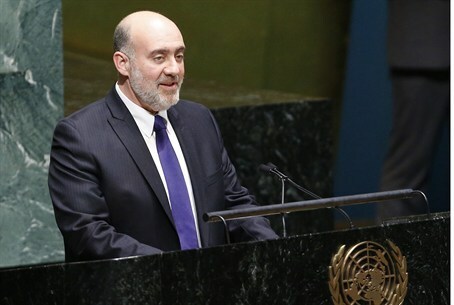 Prosor added, "Settlements are not and never have been the main obstacle to peace. The real obstacle to peace is the Palestinians' demand of return, their refusal to recognize Israel as a Jewish state, the continued terrorism and incitement against Israel. If the Security Council really wants to contribute to the peace process, it must address these issues." A statement released by the UK, France, Germany and Portugal earlier on Wednesday said the four are “extremely concerned by and strongly oppose" Israel's construction plans. on Tuesday, U.S. State Department Spokeswoman Victoria Nuland used strong language when condemning Israel's decision to build.